Last week’s culmination of the hotly contested 2010 midterm election season proved to be the biggest story in two years, filling 57% of the newshole from November 1-7, according to the Pew Research Center’s Project for Excellence in Journalism. Indeed, coverage of the historic election—which turned control of the U.S. House over to Republicans and was characterized as a “shellacking” by President Obama—registered as the fourth-biggest weekly story since PEJ began its News Coverage Index in January 2007. The others all involved the 2008 presidential campaign. The Democrats’ nominating convention and the surprise announcement of Sarah Palin as the GOP vice-presidential nominee filled 69% of the newshole from August 25-31, 2008. As the media scrambled to become acquainted with Palin, the story filled 58% from September 1-7, 2008. 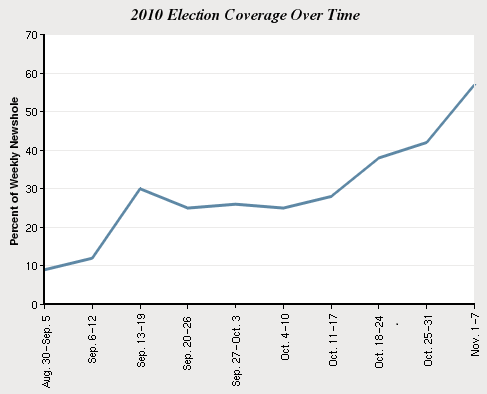 And on the week that Obama became the nation’s 44th president (November 3-9, 2008), election-related themes filled a whopping 76% of the newshole. Last week, as Republicans gained about 60 seats in the House and six in the Senate, the narrative shifted away from the numbers to bigger questions. Analysts painted a picture of a weary, angry and divided electorate, and questioned the prospects for compromise and a working relationship between the chastened president and a new Republican leadership in the House. And the tea party, which generated considerable media attention in the run-up to the voting, took something of a back seat in the post-election coverage. In some of the races that generated significant coverage—the Nevada and Alaska Senate contests, for example—the media narrative pointed to the problems for tea party candidates Sharron Angle and Joe Miller. No other story last week generated more than a fraction of the attention of the election. The state of the U.S. economy was No. 2 and made up 7% of the week’s news as October labor statistics revealed little change in the nation’s dismal employment situation. Two bombs found in cargo planes on October 29, whose origins were traced to Yemen and whose destination was the U.S., remained the No. 3 news subject last week, filling 5% of the newshole. At No. 4 was the Haiti-bound Tropical Storm Tomas, which triggered coverage enumerating the woes of a country beset by natural disasters, disease and political upheaval. The storm, which did minimal damage to Haiti, made up 2% of the week’s coverage. Finally, a post-election presidential trip to Asia—including India and Indonesia—made the news at No. 5 (2%). Unfortunately for Obama, however, much of the coverage focused on rumors that the trip would cost taxpayers $200 million a day, an allegation debunked by numerous media outlets. The midterm elections easily dominated each of the five media sectors studied last week. They filled about half the newshole in newspapers (45%), online (47%) and on network TV (55%). The politics-oriented cable networks devoted fully 75% of the air time studied to the elections, and radio—which includes ideological talk programs—devoted 64%. Much of what happened on November 2 matched what analysts and pundits had predicted. Republicans picked up at least 60 seats, allowing them to assume control of the House of Representatives, while the addition of six U.S. Senate seats left that chamber in the hands of the Democrats, albeit more narrowly than before. The week began with the traditional media election run-up of polls and projections, but soon settled into a period of taking stock of the new political landscape. On the day before voters rendered their verdict, many reporters walked through the latest polling data. NBC White House correspondent Chuck Todd, on the Today Show for example, discussed an NBC-Wall Street Journal survey suggesting that the Republicans would pick up anywhere from 50 to even 70 seats in the House. On November 2, some media outlets quickly tried to make sense of the election results as they were coming in. The days after the election yielded more long-range assessments of the new playing field in Washington. Some outlets focused on House Minority Leader John Boehner, widely expected to assume the mantle of House Speaker. On the November 3 broadcast of ABC World News Tonight, correspondent Ron Claiborn described Boehner as the “fiery leader of the Republican opposition,” but went on to describe his humble Midwestern roots. On Nov. 4, Brett Baier of Fox News interviewed Boehner and asked him about the Republican agenda in the coming two years. “We’re going to do everything we can to stop this [health care] bill from being implemented,” said Boehner. Former New York Governor Eliot Spitzer, on his new prime-time CNN program, described Obama as a “chastened president” and said “yesterday was a dark, dismal day for the White House.” Obama was indeed the lead election headline generator, registering as a lead newsmaker in 15% of the midterm stories. And some post-election analyses raised the question of whether a divided Washington could accomplish anything in the next two years. Lost, to some extent, in the post-election pondering last week was the tea party narrative—as other themes emerged in the coverage. Indeed, the role of the grassroots conservative movement in the midterms accounted for less than 10% of the election coverage studied last week. The sheer volume of election coverage squeezed out most other stories last week. The state of the U.S. economy occupied its familiar spot as the No. 2 story of the week, accounting for 7% of the newshole. Nearly half of that coverage parsed the findings of October employment statistics, which revealed no major breakthroughs. About 150,000 jobs were added that month, but the unemployment level remained stuck around 9.6%. More details emerged last week about the two cargo bombs that had originated in Yemen, making that close call the No. 3 story of the week at 5% of the newshole—where it ranked the week before. News outlets reported that one of the packages was de-fused a mere 17 minutes before it was set to detonate and the ramifications for U.S.-Yemen relations were an additional subject for analysis. At No. 4 for the week was Tropical Storm Tomas, whose Haiti-bound trajectory tapped into another media narrative, that of the poverty-stricken nation that cannot catch a break. Coverage of the storm occupied 2% of the newshole last week. A story that turned a sliver of the media’s attention away from the midterm election results made the news at No. 5 (2%)—Obama’s trip to South Asia. If the White House hoped the shift in focus would result in a positive media narrative for the president, false rumors of a $200 million daily price tag for the trip helped dash that. (The media seemed to spend as much time addressing and debunking those rumors as it did reporting on the events of the trip last week). Each of the top newsmakers last week was a key player in the midterm elections. 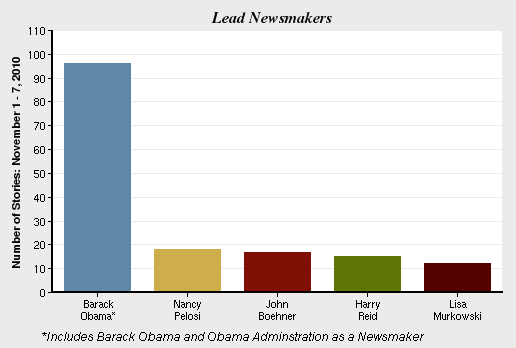 President Obama, who was the top newsmaker of the week, featured prominently in 10% of all the stories examined. Many election analysts pinned the burden of Democratic losses on Obama, as did some members of his own party who spoke to the press. Speaker of the House Nancy Pelosi and Minority Leader John Boehner were the No. 2 and No. 3 newsmakers last week. Pelosi, the focus of 2% of all stories, made the news for her somewhat surprising announcement that she would seek to retain her House leadership of the now-minority party. Boehner, also the focus of 2% of the overall stories, was the subject of profiles and interviews, as the media sought to reintroduce the man who will be third in line for the presidency. Harry Reid was the No. 4 newsmaker of the week (1%), having bested his tea party-endorsed rival Sharron Angle in a race in which many analysts thought the Republicans squandered a good opportunity to gain a seat. Lisa Murkowski, the No. 5 newsmaker (1%), was another candidate whose apparent victory tempered the power of the tea party narrative. Her conservative opponent Joe Miller, once favored to win the Alaska Senate race, looked by the end of the week to have lost the initial vote count to Murkowski, a moderate Republican who ran as a write-in—although there is a good chance the recount, and possible legal challenges, could drag on for some time.